An ATI Agrowood hardwood floor is manufactured to provide many years of trouble-free performanceand remain as a timeless classic. Even though wooden flooring is in vogue, it is also durable, easy to maintain, environment-friendly & extremely beautiful. It also offers excellent feel & foot comfort. Wood acquires character as it ages gracefully acquiring a warmer hue. The varied subdued reflection of light will give it a new life from hour to hour. Laminated & finger parquet flooring have smaller pieces or laminae which are finger-jointed together to produce longer strips. These longer strips are then edge-glued together to produce wider panels which are then cut to the respective size. The 4 edges are tongued & grooved for easy laying. The top surface is also lacquered with 5 layers of a very tough acrylic, UV lacquer for the hardness making it resistant to normal wear & tear and even to a certain level of physical abuse. The is very important as wear & tear occurs on the lacquer & not on the wood. The parquet can be either glued to the floor or it can be laid floating (without gluing on the underside). Also, after laying no additional sanding, finishing or waxing is required. The resultant wooden flooring gives a natural feel & a unique appearance which is not available in conventional materials used such as marble, granite, carpets, etc. 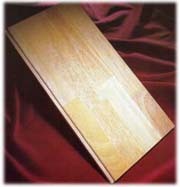 The Rubberwood for production of Laminated & Finger Jointed Parquet Flooring is pressure impregnated with Boric-Borax / Parachem Anti-Bacterial Chemicals, Kiln dried & normalised. The grade specification is applicable to the top face only. The Resins for Finger Jointing and edge gluing are polymers (PVAC, PU Combinations) which are either white or translucent. The glue joints are designed to withstand delamination tests conducted after boiling. The depth of chemical impregnation is usually above 70% and is measured by reagents. The toxicity level of the product is low and within allowable limits. Standard dimensions are: Length 2100mm, Width 210mm, Thickness 15-22mm. Exclusive The colour will be light & uniform but natural variations will be allowed UV Acrylic Lacquer (5 layers- 70 gsm) Below 10% The pieces will be Finger Jointed. The length between the finger joints will not be less than 200mm and upto a maximum of 600mm. The minimum length of the end Lamina will be 150mm. The Parquet will be tongued & grooved on all 4 edges. There will be no timber defects on the surface. Exclusive tropicalised The colour will be uniform but natural variations will be allowed UV Acrylic Lacquer (5 layers - 70gsm) Below 10% The pieces will be Finger Jointed. The length between the finger joints will not be less than 200mm and upto a maximum of 600mm. The minimum length of the end Lamina will be 150mm. The Parquet will be tongued & grooved on all 4 edges. There will be no timber defects on the top surface except natural variations in grain structure. Elegant Darker colour with variations ranging from yellow to brownish UV acrylic lacquer (5 layers - 70 gsm) Below 10% The pieces will be Finger Jointed. The length between the finger joints will not be less than 200mm and upto a maximum of 600mm. Variable end Lamina length. The Parquet will be tongued & grooved on all 4 edges. Some tapping marks & knots upto 10mm diameter will be allowed the top surface. In case of large volumes, special constructions are possible. The Lamina width will range from 35mm to 75mm. 210mm width Parquet will be made from 3 edge glued Lamina. Colour staining of the surface according to customer choice is possible. To justify it being termed as a timeless classic, the flooring will outlast all the alternative products. It can also be refinished to look like new, time after time. One must maintain the flooring & look after it as a long term investment. Use a doormat both outside & inside the door to collect soil & dirt from shoes. Also clean these mats regularly. Use waterproof trays for setting flower pots on the floor. Average humidity & temperature are good for parquet flooringextreme changes should be avoided. Cleaning is best with a vacuum cleaner or a damp, well-wrung out mop or cloth. Never use abrasives or ammonia-based detergents. For removing spots of various kinds, use the chart below. After removing the spot, wipe the floor with a moist cloth & mild, soapy water.